Khye celebrated his birthday last month September. 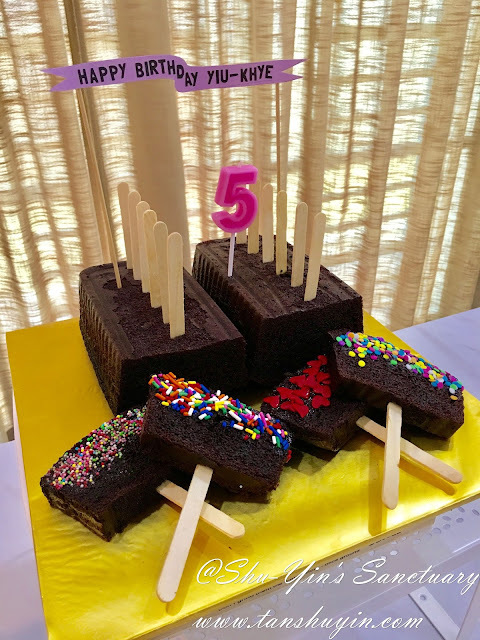 He wanted a Popsicle Party, but then he told me he wanted a no-cream chocolate cake! It seems like a simple request, but then I was scratching my head on how to decorate a no cream cake! In the end, after googling for some inspiration, I managed to get 2 Chocolate Loaf Cakes from Jenny's at RM16 each. Arranged them side by side, then poked in some ice-cream sticks in it. I cut 2 slices out with an ice-cream stick in each, and then sprinkled the cut ones with some Rainbow Rice confetti, sprinkles and hearts. 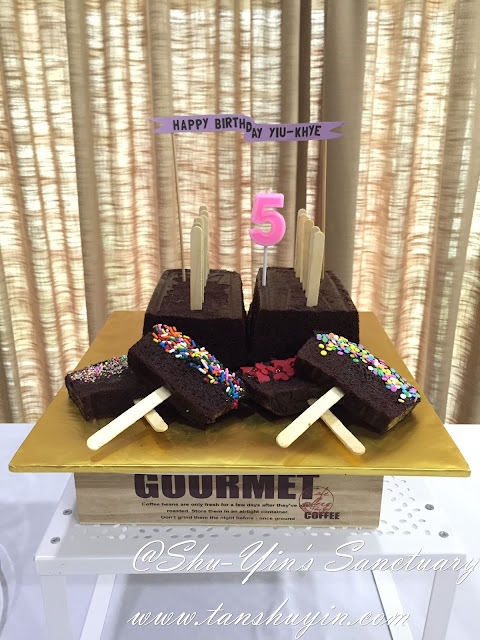 Hope they look like Chocolate Ice-Cream Popsicles! 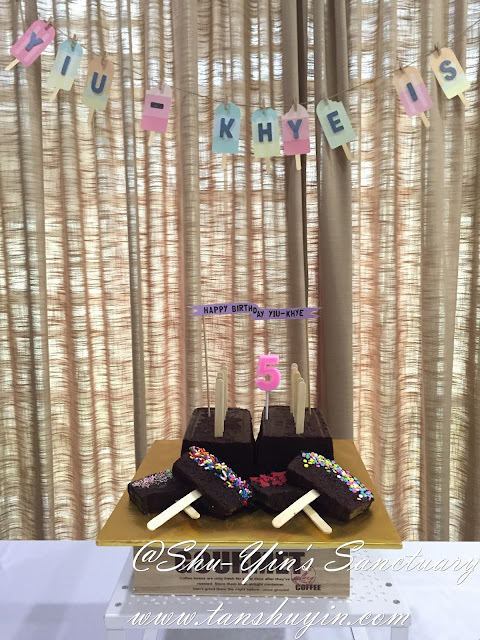 Did a birthday banner tag HAPPY BIRTHDAY YIU-KHYE and stuck a number "5" Candle on it! Very, very simple indeed and also the cheapest birthday cake I've decorated! 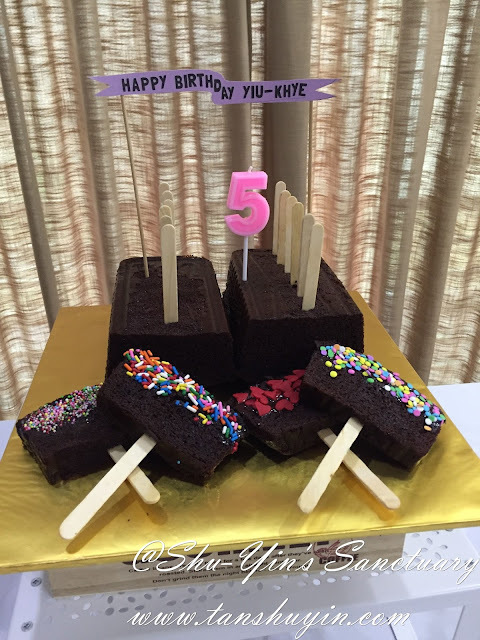 Ta da......an awesome One-of-a-kind POPSICLE no-cream Birthday Cake for my beloved Khye! Click below to get inspirations from all the birthday cakes I've decorated for my kids' birthdays!